Hey Guys! Brent here. I’m at Seal Rocks Lighthouse today to get some photos of the beautiful surroundings. While scoping out the area for a great photo opportunity, I found it…the single monolith rock in the waters off the beach below, with waves crashing all around. It was stunning and I wanted to capture the moment. Many beginning photographers make a common mistake: they don’t pick a single point of interest, which makes the scene so much more powerful. Instead, they try to capture all of what they see, which often includes many points of interest. But this results in a photo without much impact. Picking just one point of interest is the best way to make a statement and communicate with your audience. Watch the video to see how I picked out and isolated a single point of interest and used a long exposure to communicate my vision of this awesome landscape that has so much to offer. When starting out in photography, it’s a very normal thing for people to want to capture everything they see. Through photography, the world comes alive in a new way and you want capture entire scenes to show just how awesome they are. Every little element becomes fascinating and new photographers end up capturing many of these in a single photo thinking it will reflect what they saw and impart that same mood to the viewer. The problem is, it doesn’t. When focusing on many subjects, the picture ends up looking like a simple snapshot and leaves the audience confused about what to focus their attention on. They’ll quickly lose interest and move on to something else, which is not what any photographer wants. The easiest way to overcome this is to identify and isolate a single point of interest for your photograph and let the rest of the scene support that one element. When you do this, you effectively tell the story you saw when you took the picture in the first place. From my vantage point on the bluff, the thing that stood out to me most was the single monolith rock off the beach below. The waves were crashing all around, dolphins were playing nearby, and I really wanted to capture the majesty of the moment. To get that magical feeling into a photo, I needed to use the one piece of equipment I love most for these types of shots: a 10 stop neutral density filter. 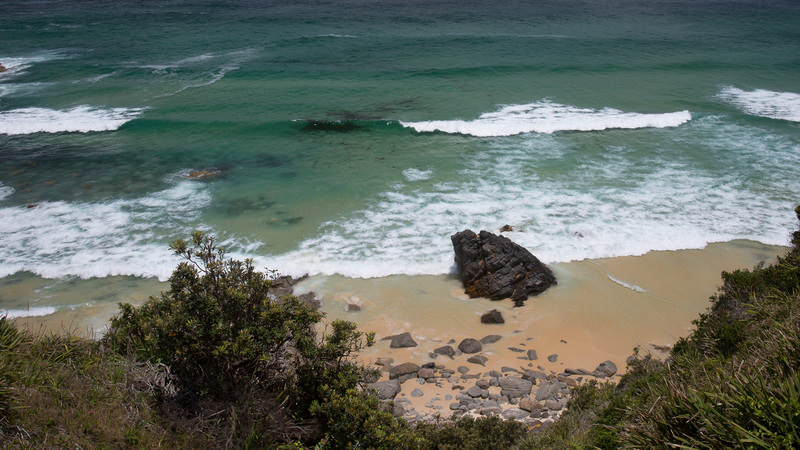 I also love the circular polarizing filter, which I have on my lens to cut the glare on the water. The ND filter is an extremely dark piece of glass that you place in front of your lens which allows you to use very long shutter speeds in bright conditions. It does this by darkening the light coming in through the lens. They’re especially useful when shooting water because they allow a longer shutter speed, which blurs the movement of the water, giving that mystical feeling I was looking for..
Look at the image that I took without using the ND filter. Notice that the rock looks more like a giant black blob, and the crashing waves draw all the attention. There is nothing of note in this picture. 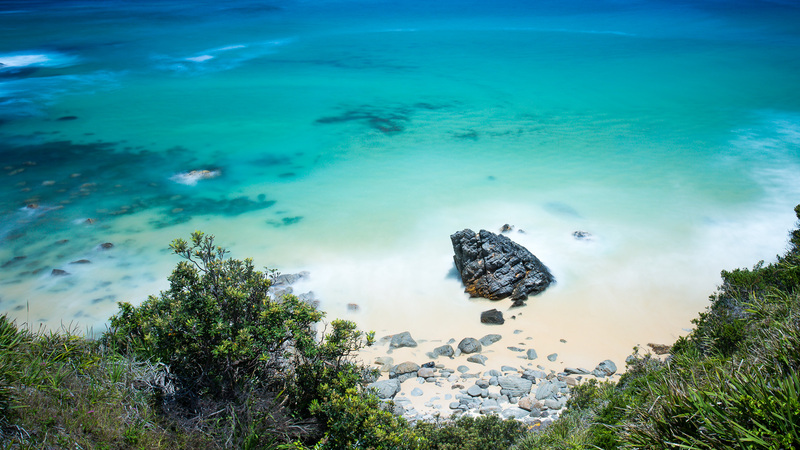 It’s simply a snapshot of a beach and some waves. It is not interesting and definitely doesn’t give you that magical feel. When I used the ND filter in this photo, notice what a dramatic difference it makes! It’s like a completely different scene even though it is exactly the same composition. The only difference is that by using the filter, I was able to use a 30 second shutter speed. That’s a lot for full daylight! But it allowed the movement of the waves to become a mystical backdrop for the real show stopper – the rock. By adding the circular polarizing filter, I was able to cut through the glare on the surface of the water, letting you see down into the ocean itself. The rock no longer has to compete with the harshness of the surroundings and the rest of the scene comes alive to help tell the story of the rock. All of this works together to isolate my main player in this picture and it makes ALL the difference. When it comes to photography, it’s all about energy and feeling to me. I want to feel good about what I’m doing. I’m creating and I want to feel the creative energy flowing to actually get out there and shoot. I do this by being in nature, which really makes me feel connected to that creativity. I immersed myself in it earlier in the day by surfing and I was just feeling the energy of this place. And that’s why I chose to shoot the image of the rock. It symbolized the feeling of relaxedness and tranquility of this place, just being around nature with no one around. It’s amazing here and simply beautiful. Landscape photography is a powerful way to inspire and awe others. Being able to portray the energy of a scene in pictures takes vision…and the proper equipment. As a landscape photographer, you must be able to identify your point of interest, the subject of the photograph that will tell the story, and then use the proper tools to isolate that element. 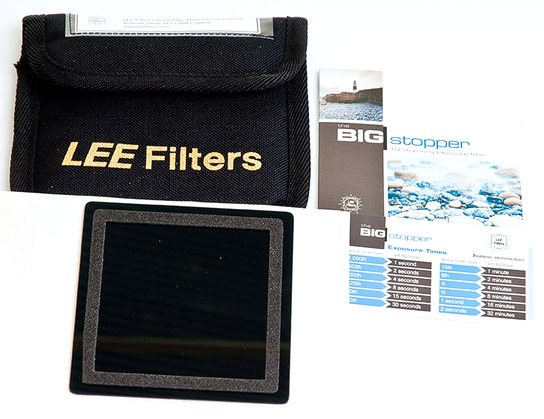 The 10 stop ND filter darkens the light coming into the lens, allowing you to use very long shutter speeds. The long shutter speeds allow the movement of water to blur, creating a mystical feel. This effect can then be used to isolate your subject and make a dramatic impact. The circular polarizing filter will cut through the glare on the surface of the water, allowing you to see down into the water, which can help support the story of your main point of interest. Although ND filters can be rather expensive, they are an investment well worth making, and all serious landscape photographers will eventually have the need for one. Circular polarizing filters are more reasonably priced and are a great way to start out with photographing water. Finally, take some time to get into the energy of the place you’re shooting. Be in nature and really take in your surroundings. Notice how you feel being there and find something that symbolizes that. Photographers have a unique perspective on the world. Use that to pick a single point of interest that tells your story and shoot away. 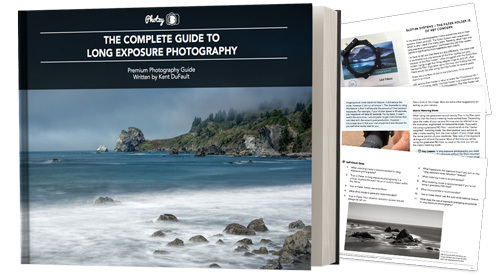 Have a look at Kent’s guide to learn his amazing techniques, which will help you master the art of long exposure photography. Give your images that magical mysterious aura that everyone loves. It’s a great way to re awaken that inspiration for landscape photography! Kent & the team at Photzy have been kind enough to offer my blog readers (that’s YOU!) a special deal on his amazing guide. This special price is only available for a limited time, so CLICK HERE to grab it now – for 52% off!